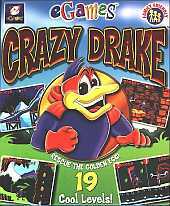 Crazy Drake is a side-scrolling action game similar to Earthworm Jim, in which the player controls a duck, Crazy Drake, through various levels set in six different episodes. One night in LoonVille, Prince Drake was playing his favourite video game. Unbeknownst to him, the Evil Dr. FoulBrain broke into the palace and stole the Sacred GoldenEgg, which was the source of power in the kingdom. Since Prince was to blame for not guarding the egg, he knew what had to be done and became Crazy Drake. The game controls like a standard side-scrolling platformer. The player's main attack is a gun with unlimited ammo and they can find special items that can give them Silver Bullets for the gun and a special secondary weapon called SmartBomb. The levels are ridden with hidden items like extra lives, first aid items, and even items that will teleport the player to hidden and secret levels. The eGames version is different to the original DOS version. For example, Drake wears a red mask and lives in Ducktroplis in the eGames version; while in the original 1996 version he is bare-faced, making a silly face, and lives in Loonsville.